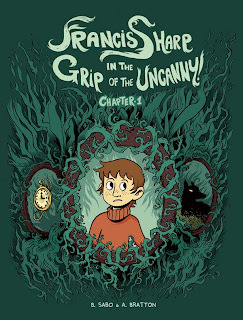 I just got and read a copy of Brittney Sabo's & Anna Bratton's Xeric-winning Francis Sharp in the Grip of the Uncanny! Let me say off the bat that it's easily one of the most fun, entertaining books I've read all year! It's a little hard for me to pin down exactly what drew me into the story. Francis isn't the type of character I'm usually drawn to -- he's irresponsible, self-centered, impractical and not entirely ethical. Despite those flaws, he's still an affable character and one does get the sense that he's going to learn a thing or two by the time he eventually does get home. (This book is only chapter one, after all!) We don't see much of Francis' parents or his friend (although, the dynamic between he and Francis is quite well done) and the two goblins who help Francis later seem nice, but they're introduced late enough in the story that we don't get to see a whole lot of characterization with them yet. Sabo's art is well-suited for this tale. Her figures are smooth and pleasant-looking (some really nice line work with them overall) and she's also got a very good eye for using spot blacks to create/enhance the mood. Especially potent on the key story beats, like when Francis overhears his parents discuss their financial problems or when he first realizes that he's in a strange town full of goblins. At some level, the book has a Wizard of Oz/Alice in Wonderland notion running through it. Young kid who doesn't care for his/her home life falls into a magical realm, and learns to appreciate how great home really is. What strikes me as somewhat different here, though, is that, while Francis is surprised and apprehensive about this new world, it bears a number of similarities to his old world. An interesting angle that appears to be developing is that both Francis and his goblin friend have an mutual interest in cryptozoology but, while Francis reads about Bigfoot and the Loch Ness Monster, his counterpart studies fantastic creatures like... squirrels. The book, as I said, is a lot of fun. I read (and review here) a lot of comics that are good -- even great -- and a lot of the creators' skills show through. And while Francis Sharp certainly does have some talent behind it (good storytelling and art, smooth dialogue, etc.) I just plain enjoyed reading it. I can just imagine the Xeric judges looking at this and saying, "Let's not bothering voting this time around; just put the award in the mail for this now." Francis Sharp in the Grip of the Uncanny! Chapter 1 is available here for $10. An eleven page preview is also available at the site if you're not convinced yet.